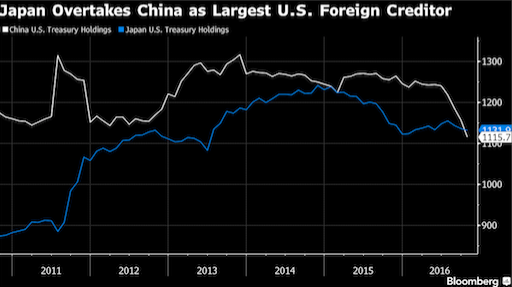 China’s stake of U.S. Treasuries has fallen to the lowest in more than six years, permitting to Japan to become America’s top foreign creditor. This is due to China’s plan to save the renminbi using its exchange reserves. 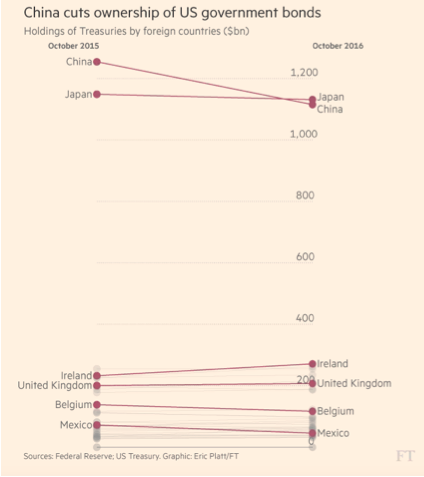 A monthly Treasury Department report showed that China’s ownership of US Treasuries fell by $41.3 billion down from the prior month to $1.12 trillion in October, the lowest investment since July 2010. Japan’s portfolio decreased at the same time, falling by $4.5 billion to $1.13 trillion, according to the data. Collectively, the two nations account for about 37 percent of America’s foreign debt holdings. China’s stunning decline has been led by the central bank with the purpose, as it has been mentioned before, to support the local currency. The renminbi has fallen more than 15 per cent against the dollar. Selling US bonds China is trying to stop capital outflows together with a plan to limit Chinese companies overseas acquisitions and dividends payment to foreign investors. The following graph shows the holdings data before the presidency elections and right after Trump’s victory that’s sent the US dollar soaring; a new challenge to face by emerging market economies.